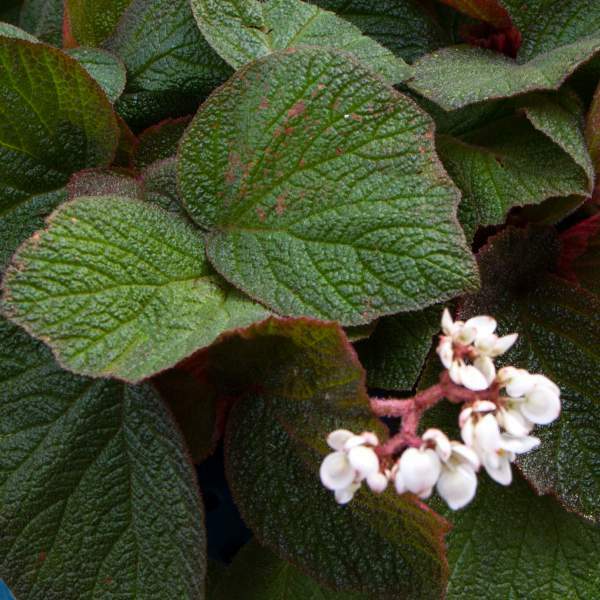 Morocco Rhizomatous Begonias are flowering begonias, but are mostly grown for their unusual foliage. Their textured leaves are red underneath and they boast a compact mounding habit that makes for beautiful hanging baskets or floor pots. Your customers will appreciate the diversity this plant brings to your retail space. For best results with Morocco Rhizomatous Begonias, use a constant feed program of 150 ppm N with a balanced fertilizer to maximize color development. Maintain a pH between 6.0 - 6.5. No pinching is required for Morocco Rhizomatous Begonias, but an occasional trim can help shape your pot. Morocco Begonias should be spaced adequately to allow airflow and light penetration between the foliage. Usually 12-18” will be enough, depending on pot size. Morocco Rhizomatous Begonias naturally crown in a rosette shape, so no PGRs are necessary. Aphids can be attracted to Morocco Begonias. Morocco can be susceptible to the fungal disease powdery mildew. To treat, spray the infected plants with a fungicide (including neem oil, sulfur, lime-sulfur, or potassium bicarbonate). Avoid overhead watering and space/prune plants for good airflow to reduce humidity. Remember not to compost any infected plant as the wind can carry this fungus to healthy plants. Also, watch for botrytis while the days are short. This grey rot is usually associated with wet or humid conditions. You can prevent botrytis by allowing the plant to dry out between waterings, allowing for good airflow in your greenhouse, and spacing to allow the sun to penetrate to the soil level. The most common chemicals used to treat botrytis are Medallion and Banrot. Use them as a drench according to each label’s instructions. No pinching is necessary. Watch these plants grow and delight your customers!